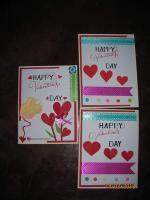 Need More Sympathy Cards Verses? 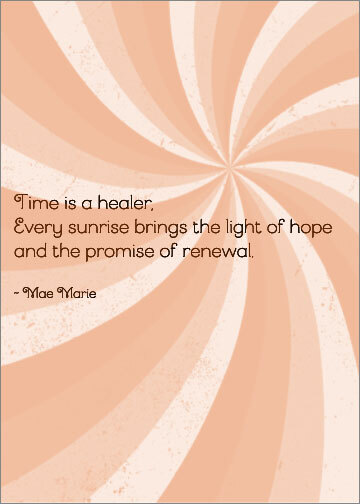 More sympathy cards verses to help you write the words in your bereavement cards. Just choose one of these bereavement verses and add it to your store-bought or homemade sympathy card. Hope that the funeral verse that you chose will be a comfort to those who are grieving. This is the second page of sympathy verses for your sympathy cards. The first page of bereavement verses can be found by clicking here. Into each life some rain must fall but sunshine does appear. Let faith and hope into your heart and keep your memories near. It will be the little things you remember, the quiet moments, the smiles, the laughter. And although it may seem hard right now, it will be the memories of these little things that help push away the pain and bring the smiles back again. and turns the darkness into day. I don't doubt that you can do it alone, but why should you have to? I'm here for you just as you've been there for me. Gone from our sight but never from our memories or our hearts. I know your life is tough right now... and I wanted to say that I'm thinking of you with love and support. I wish I knew what to say to make things better but sometimes words just aren't enough. Life can be so hard sometimes and I'm sorry to see you hurting. Those we love remain part of us. and the promise of renewal. Wishing you the peace of knowing that this life is not the end. the memory becomes a treasure to hold. near through every new tomorrow. of our thoughts and prayers. to you in your sorrow. You and your family were in our thoughts today. 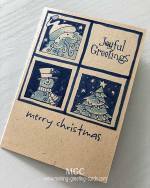 Do you have one or two sympathy cards verses or poems that you like to include here? If so, please do send it to me and I will add it to the above few verses. Do make sure that they are not copyrighted materials. You can find this handmade 'thinking of you today' card in the Cheer Up the Lonely submission page. 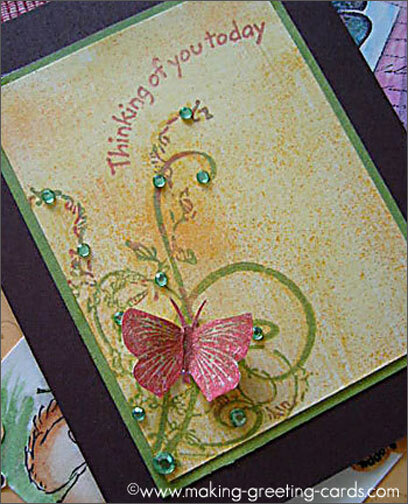 This particular greeting card was created using two rubber stamps: a flourish and a butterfly. It was embellished with sparkling emerald self adhesive rhinestones. I love this card because the overall card design just speaks to my heart. The fluttering butterfly, the lightness of the flourishes, the orange color background and the sparkling rhinestone; all these speak to me of life. Life's fragileness and at the same time life's wondrous potential energy and possibilities. 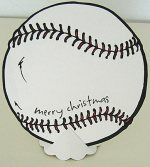 Click here to view this handmade card and maybe at the same time you might like to submit one of your own homemade card too. Tips : You can use the above card design for bereavement cards. Just add sympathy cards verses to them. 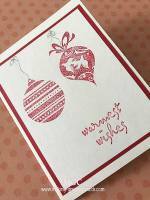 For example, With Deepest Sympathy in front and choose another verse from the sympathy cards verses for the inside of the card as the message.